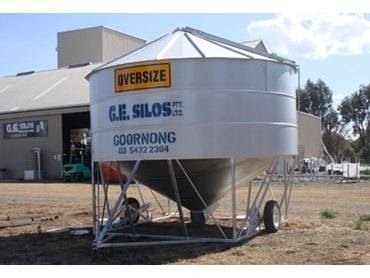 When it comes to field bins GE Silos is a small manufacturer, operating in a competitive market. The Goornong-based company employs six people in the small town, northeast of Bendigo. GE Silos manager Jason Comer saw that the organisation needed to cut costs to maintain its competitive edge. A redesign of the field bins helped do the trick. Not only did this improve the functionality of the field bins, it also significantly cut their manufacturing time and improved their usability. The new design has no centre cap. The door now opens right up to the point of the cone and access to the augers is improved. The wheel set up has also been modified. Older models had a ratchet ram to extend the silo wheels. This worked effectively but was hard on farmers who had to sweat through ratcheting two wheels on hot days. The new system has extra strength and uses a small bottle jack to provide the extension. The redesign has made the field bins easier to build and easier for the farmer to operate. As Comer puts it, " Previously manufacture involved a lot of different parts and lots of bits and pieces and was quite a delicate opeartion.....so we redesigned it and in doing so made it a much easier build." Now GE Silos now have a more competitive product and their clients have some technical innovations.......everyone’s a winner.